It’s the fall again and for all those involved in restoration, it means that rains are coming and the time to plant grasses and trees is near. The Putah Creek Council and UC Davis Putah Creek Riparian Reserve were so happy with the volunteer turnout to raise native grass plugs last year that we will be continuing the program this fall. 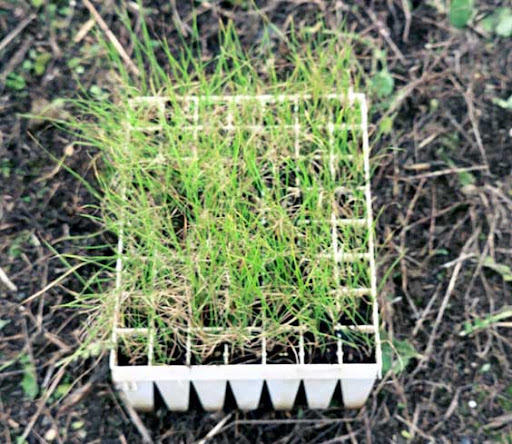 As part of the program last year, you helped raise and plant 8,000 native grass plugs. At the seeding days, volunteers will be provided with native grass seed, trays, soil, fertilizer and instructions. There are two seeding days scheduled at the UC Davis Putah Creek Riparian Reserve from 10:00 AM to 11:30 AM (November 19 and December 17). Individuals and classrooms got involved in the Fall 2004/Winter 2005 Adopt-A-Flat project with some students using the grass plugs plantings as the basis for larger environmental projects. Linda Biewer-Elstob’s fifth-sixth grade class from Patwin Elementary used the Adopt-A-Flat program as part of their Jiminy Cricket Environmentality Challenge for which they won 2nd place statewide. They were among 40,000 students in the state of California that participated in the challenge. From Interstate 80 take the Highway 113 exit North toward Woodland. At the stop sign turn left on Hutchison Drive and go 1.4 miles. Turn left (south) onto Hopkins and go to the end. Turn left and park along the road. This is the Alpha Phi Omega Picnic Grounds at the center of the reserve. Native grasses, like the ones used in our seed mixes from Hedgerow Farms are well adapted to local environmental conditions. They evolved with the other plants and animals in the area. Native grasses help to maintain or improve soil fertility, reduce erosion, and often require less fertilizer. One of the most important reasons, especially for Putah Creek, is that functioning, healthy native grass and plant communities are better able to resist invasive plant species (like arundo and the prickly yellow star thistle). Native plants also provide familiar sources of food and shelter for wildlife. Creeping Wildrye: This tall grass spreads by rhizomes (underground roots that can form new plants), making it good for ero sion control. It lies flat during flooding, so water flows past. It grows on mostly heavy soils in riparian areas and is the most com mon and widespread native grass of the Sacramento Valley. It provides good water fowl and upland game nesting habitat. Purple needlegrass: Our California state grass, this is well adapted to droughty soils and clay soils. It has a strong root system and establishes well on disturbed areas. It will resprout after spring or fall burns. Blue Wildrye: This highly variable species is a very tall perennial bunchgrass. It tol erates wide variations in soil and weather conditions. It is good for streambank resto ration and excellent for burned or disturbed areas in oak woodland. It can provide habi tat for mammals, birds, and waterfowl. Slender Wheatgrass: Adapted to clay soils, this perennial bunchgrass is tall, up­right, and fast growing. It prefers open, sunny areas and is primarily a riparian and wetland grass. It provides habitat for nest ing birds and wildlife and its dense root system allows it to survive most fires. It was used by Native Americans for food. CA Native Grass Association Know Your Natives: A Pictorial Guide to California Native Grasses (Full color images of seeds, seedlings, mature plants, and seedheads of 20 grass species on heavy glossy stock paper for field use). Costs $30 and is available by contacting the Yolo Resource Conservation District at (530) 662-2037, ext. 119 or yolorcd@yolorcd.org .